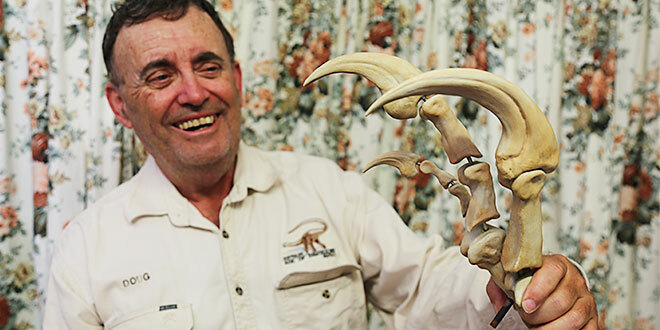 Dinosaur country: Doug Miller with a replica “claw” of Banjo, an Australovenator wintonensis “Winton’s Southern Hunter”. DOUG Miller was bitten by the dinosaur bug 12 years ago. 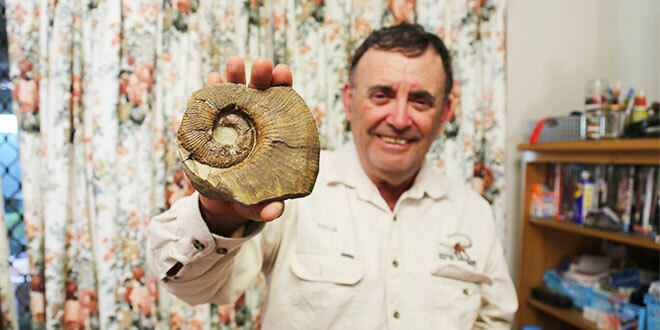 Now the parishioner from St Anthony’s and St Luke’s, Alexandra Hills-Capalaba, spends more and more time digging, sifting and preparing fossils for all of us to enjoy. When he’s not on a “dig”, Mr Miller, 62, can often be found spreading his love and enthusiasm for palaeontology with neighbourhood school children, retirees and the scores of interested people who attend his library talks. One of his favourite stories involves his part in helping to unearth Banjo, Australia’s most complete carnivorous dinosaur fossil – the remains of a creature that roamed the continent 9.5-10 million years ago, was five metres long, stood 1.5m high at the hip and weighed 500kg. 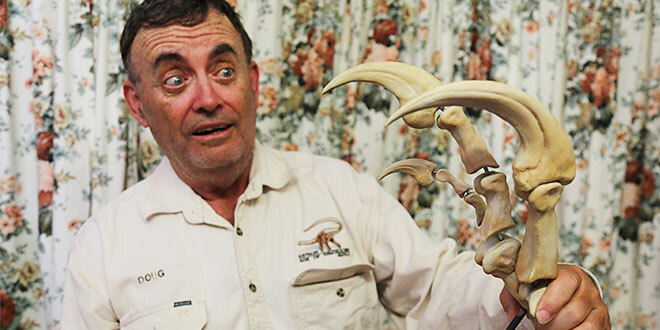 “His arms are articulated and if he grabs you, you’ve got three very long claws sticking into you. The more you struggle, the deeper they go in,” he said. Mr Miller became interested in dinosaurs after watching the BBC TV series Walking with Dinosaurs in the 1990s, but his personal passion for palaeontology began in the waiting room of a doctor’s surgery. He picked up a local paper with an advertisement seeking volunteers to join a Queensland Museum dinosaur “dig” at the Mt Etna bat caves north of Rockhampton. 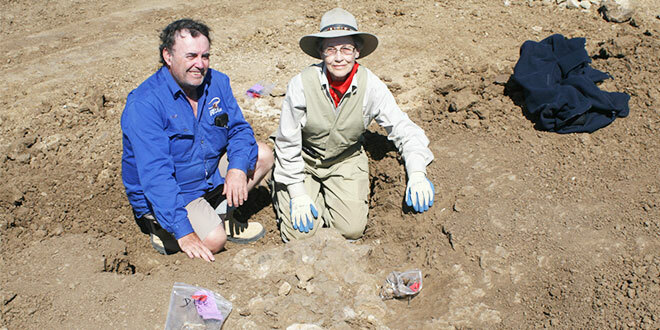 He rang, only to find the dig had been cancelled, but he was told if he was really interested he should call David and Judy Elliott, the founders of the Australian Age of Dinosaurs Museum of Natural History in Winton. “So I rang them, got myself onto the following year’s dig,” he said. It was knee-deep in the dirt of outback Queensland that Doug discovered his lifelong passion. “Where’s this been all my life?” he asked himself. “I couldn’t believe what fun I was having digging dinosaur fossils up. And I’ve been involved with them ever since. Working hard: Doug Miller and dig companion during a overseas venture in Mongolia in June. The Age of Dinosaurs Museum at Winton is built on the edge of a “Jump Up” or mesa, and it is here that Mr Miller said he found the tranquillity of the outback landscape that could soothe the soul. “There are places out there where you just sit on the edge of the cliff and look out over the valleys below and you can sit there for hours and nothing would bother you – a totally quiet, reflective place.” he said. Apart from the thrill of discovering dinosaur bones, Mr Miller volunteers as a dinosaur fossil technician. This entails preparing fossil specimens and can include moulding, casting and painting casts for research, display and education. “Becoming an honorary fossil technician was one of the proudest moments of my life,” Mr Miller said. “Now, to do it overseas I couldn’t believe it. I always wanted to go to Mongolia – but to go to Mongolia and dig up dinosaur fossils – wow,” he said. Mr Miller has just returned from a second trip this year, travelling to the Mongolian “badlands” – a vast region of grass and shrubs that is almost void of trees. “This time we found a protoceratops, a small creature called a hadrosaur and an ankylosaurus,” he said. In the meantime he’ll continue his public talks, and particularly encouraging youngsters to try fossil hunting. “If I’d known about dinosaurs 40 or 50 years ago I know what I would have been. I would have been a palaeontologist,” he said.